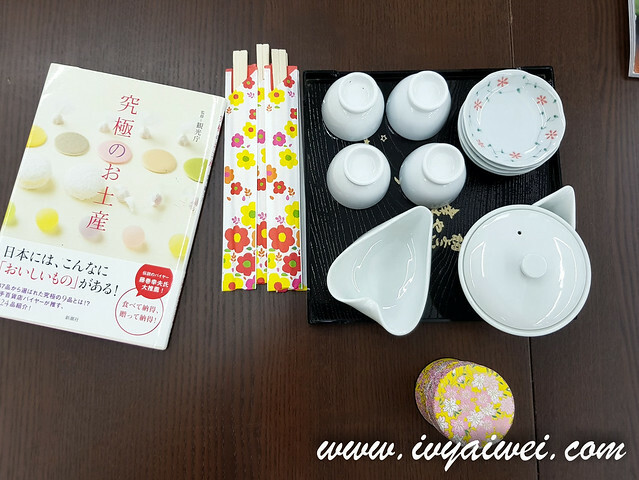 It is my great pleasure to join the tea ceremony lessons at ILOHA Culture Centre. 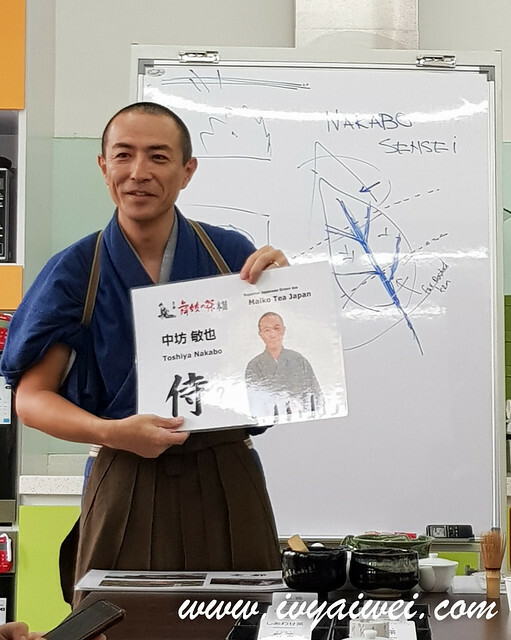 The demonstration of making Japanese Gyokuro Tea and Matcha Tea was conducted by Toshiya Nakabo-san, the Japanese Green Tea Master from Kyoto. In Japan, Kyoto, Hiroshima and Shizuoka are the places well-known for Japanese green tea farm. And MaikoTea is one of them, established in Kyotanabe City of Southern Kyoto, near Uji, an area which is the first birthplace of Japanese Green Team in year 1975. 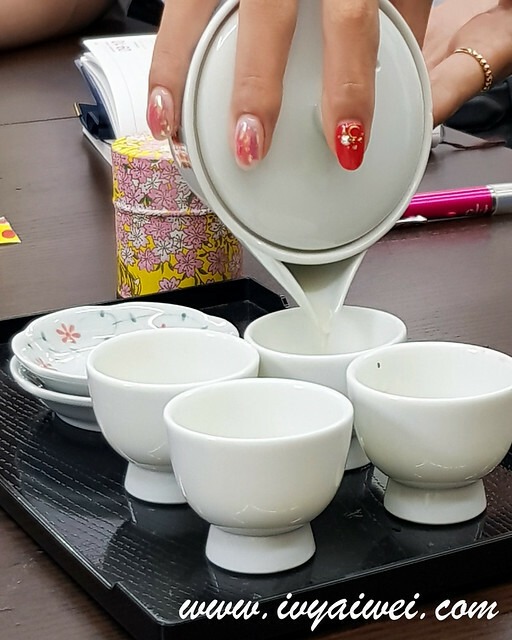 The MaikoTea store in Japan has a lot of cooking and learning tea seats available for foreigners and locals to enjoy the process of making tea. Over 150 pairs of marriage couples went to MaikoTea store for the knowledge of making and enjoying tea together. It is believed that enjoying a good cup of tea together can builds good relationships and have better conversation with each other. Japanese celebrities came to enjoy tea at MaikoTea store as well. If you are interested to visit MaikoTea store in Kyoto, the best time to visit is during the spring season (April or May), a lot of sakura trees outside MaikoTea store. From the lessons, I have learnt that Sencha and Gyokuro are actually the same species of green tea. The only difference is the growing method. Sencha tea leaves are grown directly under the sunlight without any cover shed while the Gyokuro tea leaves are grown with cover shed, away from the sunlight. Therefore, the outlook might looks the same but in term of taste, there is a big difference. 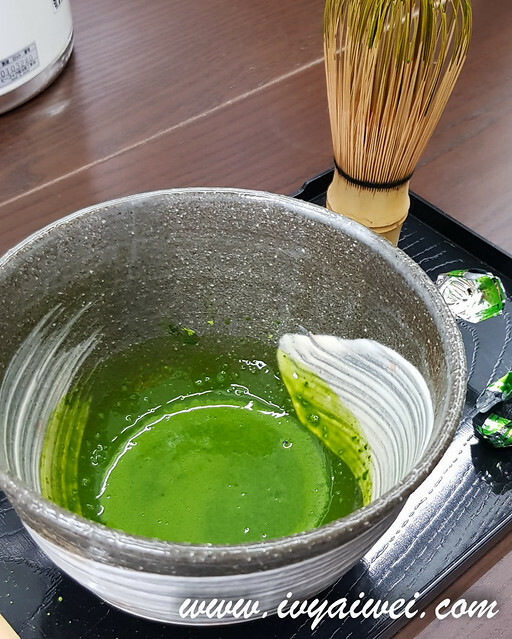 Matcha Tea is made from Gyokuro. The Gyokuro young tea leaves are picked and dried, rubbed with hands into Tencha-like before it is transformed into fine powder. Karigane Tea is the combination of tea leaves and stems. It is used as drink daily because it is a lot cheaper than the others green tea. Hojicha Tea is from Sencha tea leaves but it has been roasted into brown colour. Genmaicha Tea is from the combination of Karigane and roasted brown rice. Therefore, the smell is pretty good with the presence of the roasted brown rice. Many people loves it because of the strong roasted smells. Happiness Tea is available from MaikoTea store only. It is the special mixed of the karigane, roasted brown rice and matcha. 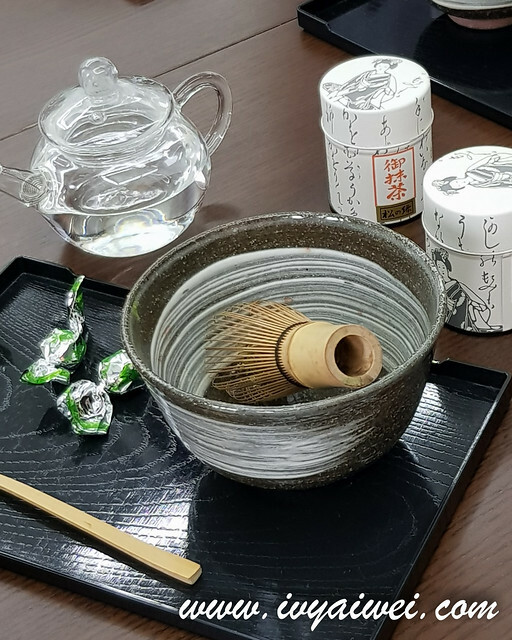 It is said that ones will be very happy with the pleasant smells of the tea and also the good taste of the tea while enjoying it, therefore, it is named as the Happiness Tea by MaikoTea store. 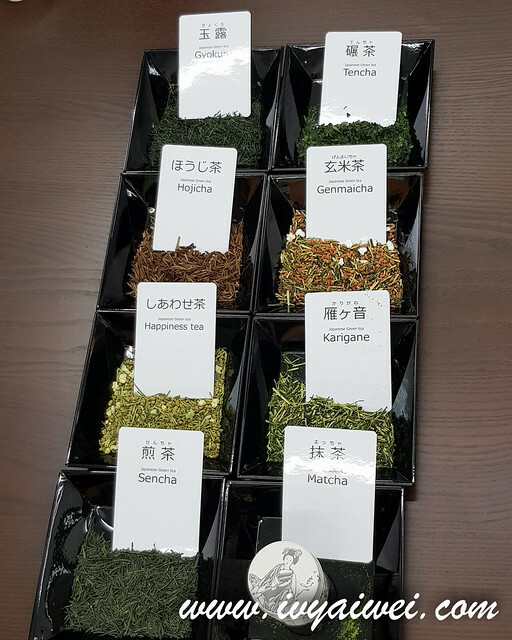 I believe most of us are bound to only the limited selection of tea namely Sencha, genmaicha, matcha… but there are actually more. 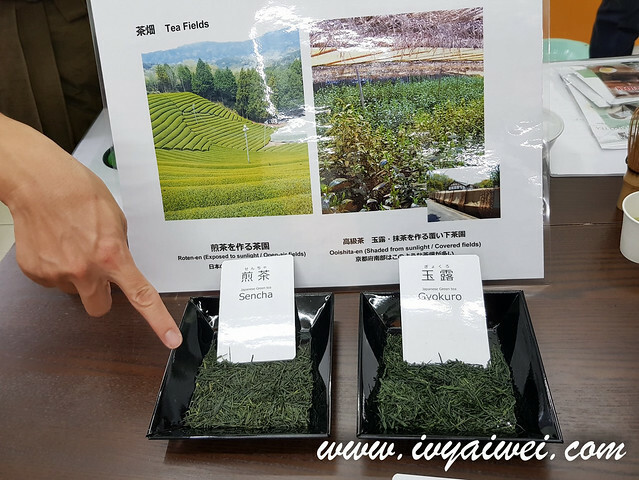 This workshop aimed to promote the Gyokuro Tea as well as to introduce and knowledge-sharing on the finest green tea – Gyokuro Tea. 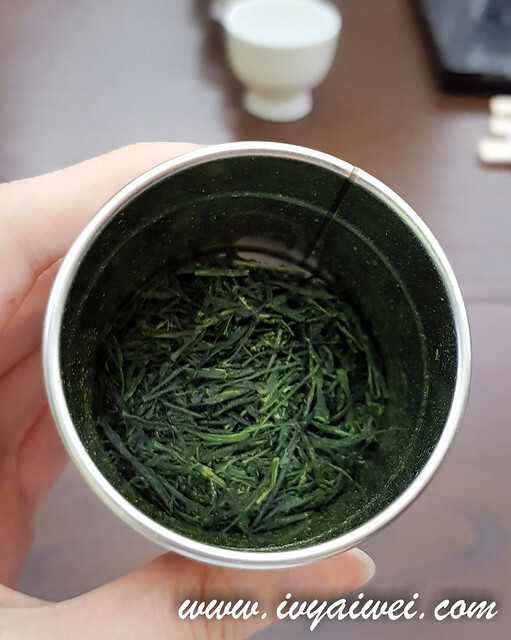 Gyokuro Tea is the finest green tea in Japan. The production of the gyokuro tea is a way more exquisite than any other green teas. Every step is done with special care and it is grown away from direct sunlight with cover shed. The cover shed is done by hand and with lots of hard work from the manpower. Gyokuro Tea is a very expensive in Japan because of the limited quantity of production in a year. Therefore, it is only served during special occasion and ceremonies. 1. First, pour boiling water into the glass pot. 2. Wait for about 5 minutes till the boiling water was reduced to lower temperature. 3. Then, pour the water into the tea pot. 4. From the tea pot, pour the water into 4 cups equally. 5. Next, put the Gyokuro tea leaves (about 8 grams) into the tea pot. 6. Water in the cups will then pour back into the glass pot. 7. Then, pour the water from the glass pot into the tea pot. 8. Wait for about 2 minutes and divide the tea equally into 4 cups little by little in the sequence of 1,2,3,4 and 4,3,2,1 so that the tea can be distributed evenly in each cups. 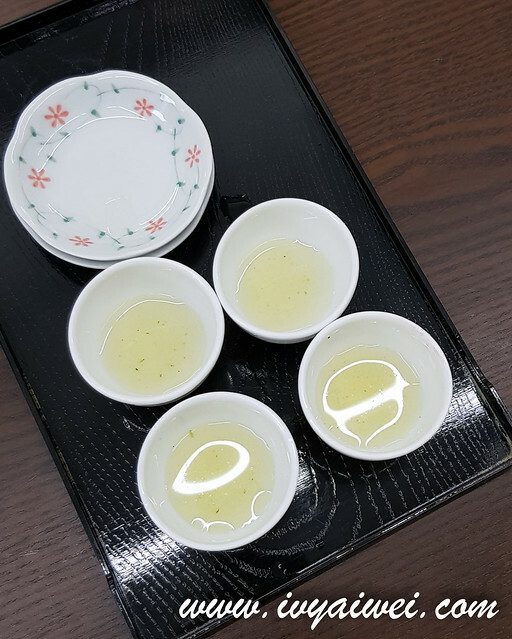 We were strictly reminded by Toshiya Nakabo-san while serving the Gyokuro Tea for not to fill up the cup with one pour and pour with the sequence of 1,2,3,4 and 4,3,2,1 till the last golden drop of the tea. It is very important step to make and serve a good cup of tea. The Gyokuro Tea has a very sweet umami taste with an extremely gentle flavor. I love this very much!!! 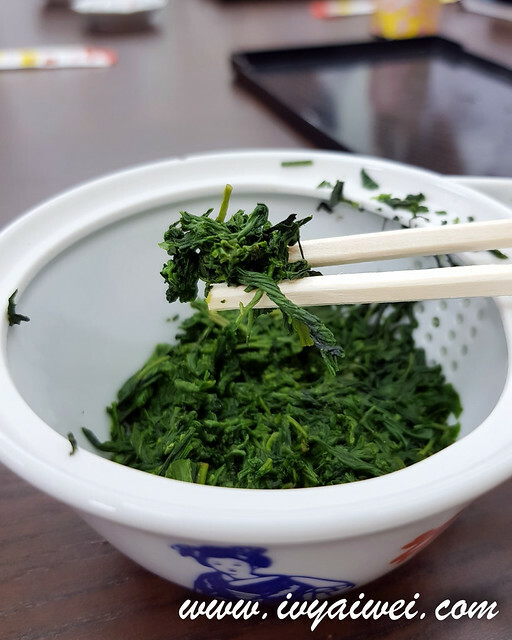 You can even enjoy eating the Gyokuro tea leaves with some soy sauce or sake or even on its own. This is definitely the tips of the day as I don’t even know this! 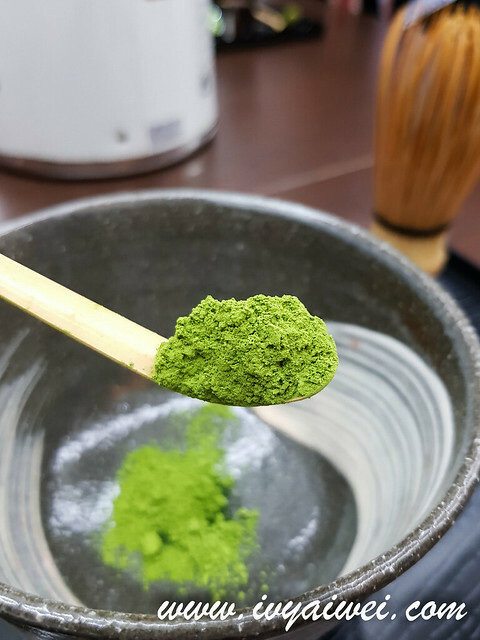 It is claimed to bring beneficial to health like Matcha Tea (drinking down the whole tea leaves in fine powder form). 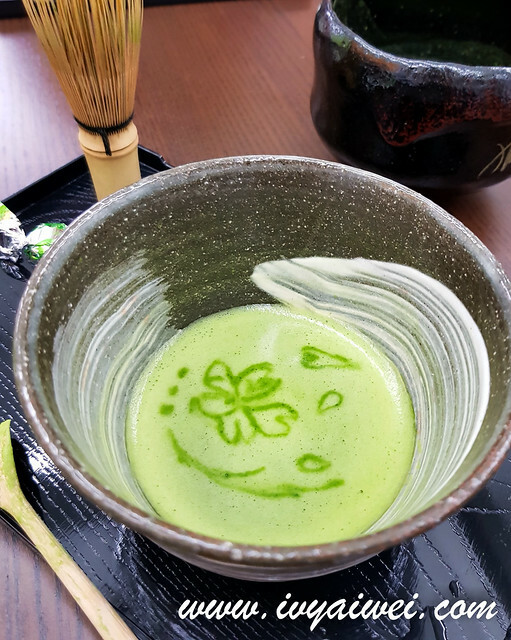 Matcha Tea is also very expensive in Japan and only use in special occasion and ceremonies. However, there are many bakeries used matcha for baking and desserts nowadays. 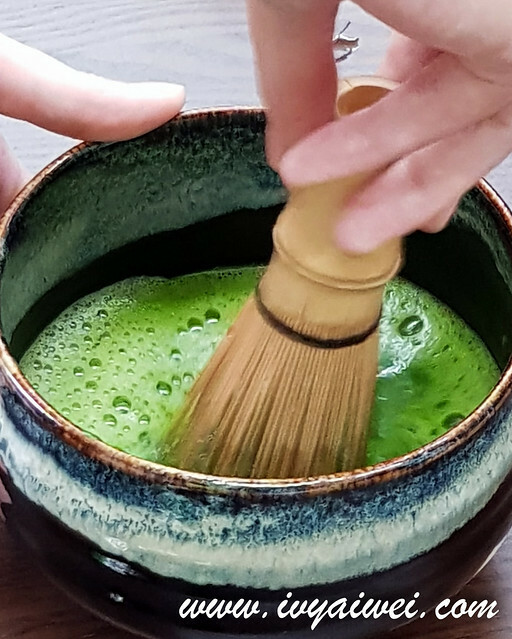 Hence, there is higher demand in matcha tea all over the world. 1. First, scoop a spoonful of matcha powder into the bowl. 2. Then, pour hot water into the bowl. 3. Next, use the whisk to stir in M-symbol form with quick hand and firm motion in standing position straight arms. 4. 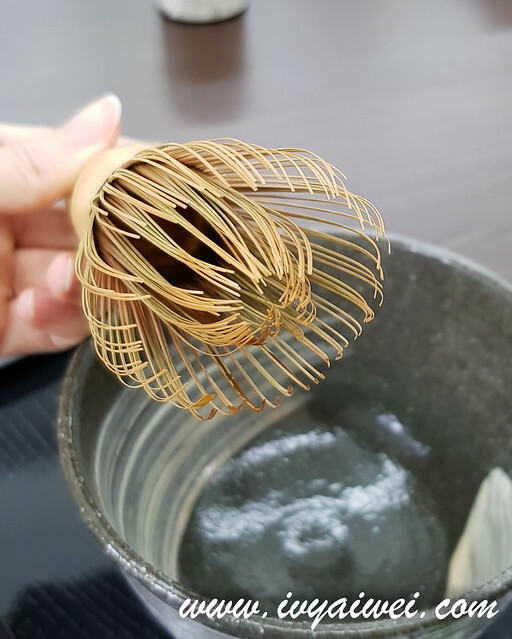 The tip of the whisk should never touch the bottom of the bowl. 5. Whisk until there is no lumps with creamy smooth surface and tiny bubbles. 6. Then it is done and ready to be served. 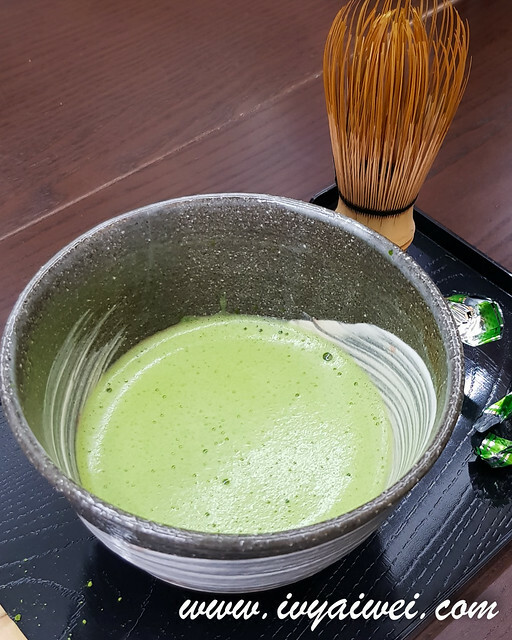 Matcha Tea is best served with some sweets like mochi or wagashi. The sweetness from the sweet will balance up well with the bitterness of the matcha. Therefore, it is like a perfect match for each other. MaikoTea is now available at ILOHA Culture Centre. You can book classes or purchase green tea products from them. 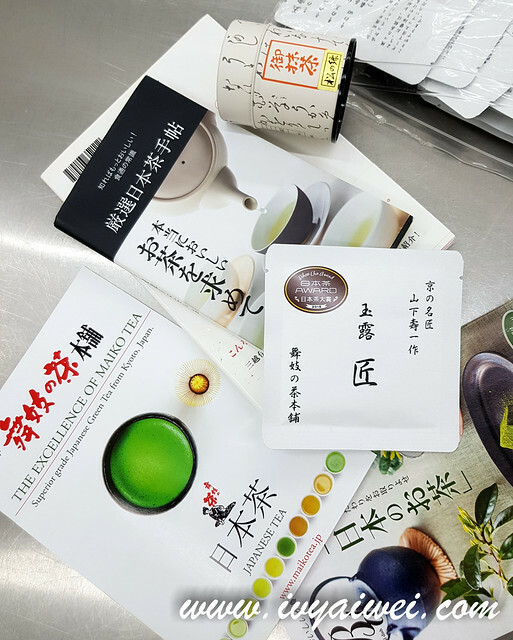 Thank you ILOHA Culture Centre for the great learning opportunity of the various types of green tea from Toshiya Nakabo-san, for example, the Sencha, Karigane, Genmaicha, Hojicha, Matcha and etc.